Slot in socket accommodates the connectors on heat oxygen sensors and has a double 1/2" drive for easy access. Designed for use in tight spaces. For use with a 3/8" drive tool. Removes and installs oxygen sensors in most domestic and some imported vehicles. Socket is slotted to allow for wire clearance. For use with a 3/8" drive tool or turn with a 1" wrench. Removes and installs vacuum switches with a 7/8" hex. Also fits some oxygen sensors. For use with a 3/8" drive tool or turn with a 1" wrench. Socket has a 1" and 1-1/6" hex to remove oil pressure sending units. Use with a 3/8" drive tool or turn with a 1-1/8" wrench. Deep design fits switches up to 2-5/8". Removes and installs 1973 thru 1977 GM thermal sensor switch and fits some oil pressure sending units. For use with a 1/2" drive tool. Fits 1-3/16" oil pressure sending units found on late 80's and mid 90's GM vehicles. For use with a 1/2" drive tool. 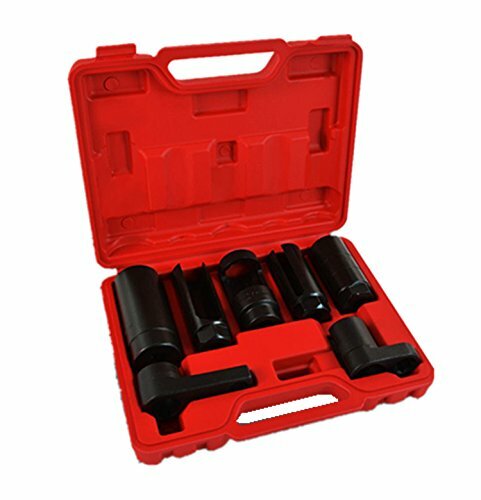 7/8" (22mm) heated oxygen sensor socket: Slot in socket accommodates the connectors on heat oxygen sensors and has a double 1/2" drive for easy access.7/8" (22mm) Low Profile Offset Oxygen Sensor Short Socket: Designed for use in tight spaces. For use with a 3/8" drive tool. 7/8" (22mm) Oxygen Sensor Long Socket: Removes and installs oxygen sensors in most domestic and some imported vehicles. Socket is slotted to allow for wire clearance. For use with a 3/8" drive tool or turn with a 1" wrench.7/8" Universal Vacuum PVS, TVS Valve and Oxygen Sensor Socket: Removes and installs vacuum switches with a 7/8" hex. Also fits some oxygen sensors. For use with a 3/8" drive tool or turn with a 1" wrench. 1" and 1-1/16" Oil Pressure Sending Unit / Vacuum Switch Socket: Socket has a 1" and 1-1/6" hex to remove oil pressure sending units. Use with a 3/8" drive tool or turn with a 1-1/8" wrench. Deep design fits switches up to 2-5/8".1-1/16" (27mm) GM Thermal Sensor Switch Socket: Removes and installs 1973 thru 1977 GM thermal sensor switch and fits some oil pressure sending units. For use with a 1/2" drive tool. 1-3/16" (29mm) Oil Pressure Sending Unit / Vacuum Switch Socket: Fits 1-3/16" oil pressure sending units found on late 80's and mid 90's GM vehicles. For use with a 1/2" drive tool. If you have any questions about this product by SUPERTOOLS, contact us by completing and submitting the form below. If you are looking for a specif part number, please include it with your message.